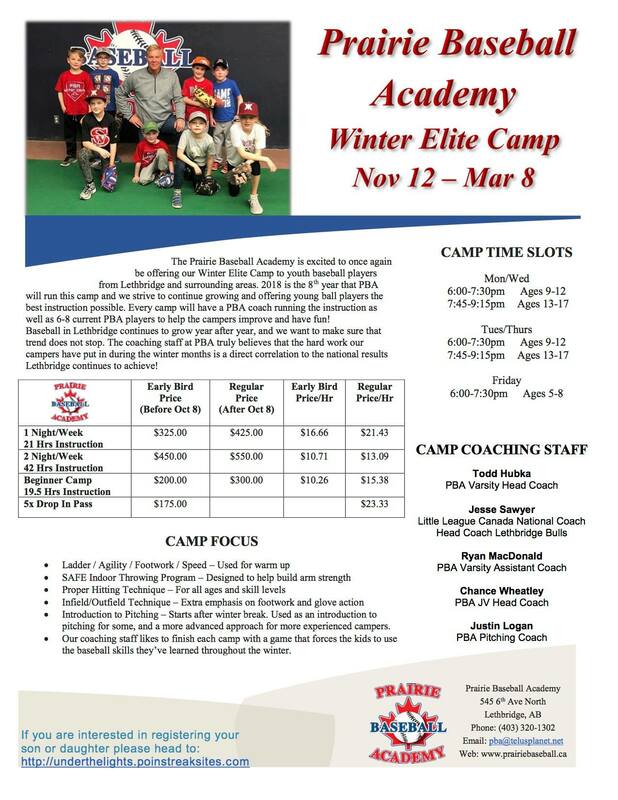 The 2018/2019 PBA Winter Elite Camp is just around the corner! Current Head Coach of the Lethbridge Bulls, Jesse Sawyer will be headlining the Winter Elite Camp as part of the Coaching Staff, along with former Head Coach of the 2015 WMBL Champion Bulls, Ryan MacDonald. Other coaches include, PBA Varsity Head Coach, Todd Hubka, PBA JV Head Coach, Chance Wheatley and Justin Logan, PBA Pitching Coach. This camp is for all ages and will help your son or daughter better their skills in the game of baseball. This 14-week camp runs from November 12th, until March 8th. For full info on the 2018/2019 PBA Winter Elite Camp, refer to the image below.